Something sinister awaits you in Our Darker Purpose. Today I finally had a chance to try out the top-down roguelike featuring a creepy orphanage full of secrets. Here's the premise: the kind teachers have disappeared, leaving in their wake a school full of chaos. We're talking Lord of the Flies type deal, only darker thanks to the Tim Burton-esque art direction. You're left no choice but to seek out answers from the administrators—who reside at the top of the orphanage. 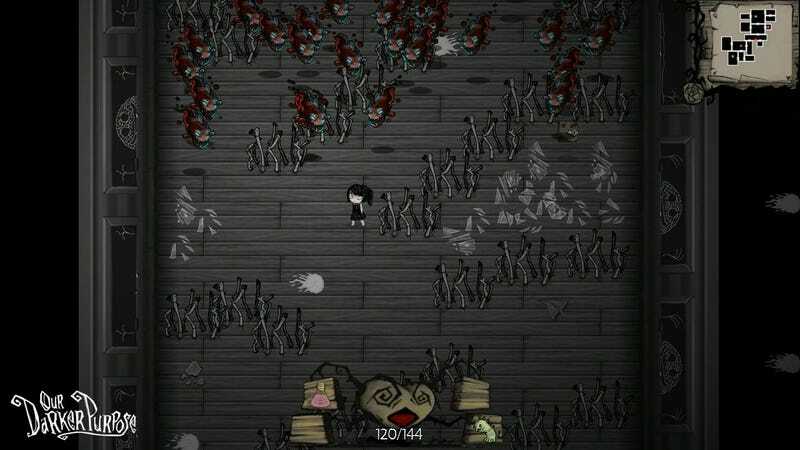 It's a good set-up for a randomly-generated game in the vein of The Binding of Isaac. In fact, Isaac players might find themselves right at home here: it controls in exactly the same way (WASD for movement, arrows for projectiles) and has the same basic gameplay core. It's easy to pick up. As you go deeper into the orphanage, you'll enter rooms which will lock behind you. The only way to move forward is to kill all the enemies in that room. Problem is, you don't know where the exit is, and the orphanage is a labyrinth that hides many terrors. Former classmates attack you. You hear whispers coming from the desks. And there are a number of supernatural creatures that seem to want you dead. Death is permanent, making the game kind of brutal—and this is that I was playing on easy. Still, as it tends to go with roguelikes, dying only seemed to make me more eager to do better and dive deeper into the orphanage. Isaac is addicting without experience points and having the ability to customize your character as you'd like; I can only imagine how gripping Our Darker Purpose will be. That, and I'm genuinely interested in finding out what happens in Our Darker Purpose. Oh! And you can roll. Fantastic. Already, I'm itching to play more instead of writing these words. At the moment, the game is asking for funding via Kickstarter, which is also where you can find a pre-alpha demo. Today is the last day for the campaign, and they need a few thousand dollars to meet their goal.